We arrived from Gatwick mid afternoon, after an hour transfer we was all very hot and sticky. We went as part of a wedding party as my daughter was bridesmaid. When we had settled in our room we found that the extractor fan in the bathroom was leaking, I contacted reception and a promptly moved us to a new upgraded room. The food was good and we had a variety of 7 different themed restaurants to choose from, we found that the Japanese, French and Italian were our favourite 3. The staff are a little bit over the top when asking for tips, and when going to the beach we were terrified as we had guns pointed at us for been outside the hotel boundaries. Very scary, stay in the boundaries! We returned here after 2 years and we knew it had been downgraded from a 4* to 3* however the place is still much the same you can see its been taken over and that the new owner have started however its early days yet. When we arrived we found the room to be clean and tidy and of good standards, however after a week we got locked out of our room twice and there was a problem with the lock so they needed to move us - However to make up for this we were given a suite which was a little tied however very nice and very clean. Please dont read all the reveiws and worry you will have a great time here however you should ask to be in block 4,5,6 or 7 as the otherside is very noisy. The staff here are really great we met the odd two or three that were not that good but in general the staff are great and remember they only earn $200 per month around $3 per day for 14 hour shifts. The food I must say I felt let them down quite badly and I was glad to get home to a nice dinner. I did however pick up a bug and had this for 5 days while there and still have it writing this reveiw, I have been advised this is a bug I have picked up and not a reaction to the melaria tablets as I thought. The Doctor advied me to not take ant medication and to drink plenty to flush the bug through and I have been given a diet to follow. I would advise you take lots of sun screen I am very dark skin and normally use factor 0 however I needed factor 8 you burn very fast here even in the clouds. The Monster Truck trip is a must however be prepared for what you see in the sugar cane this is very upsetting small children with nothing there mums and dad earn $5 per week and they are very poor. We took an extra case full of old kids clothes and toys and it was so nice to bring a smile to their little faces. We took our son for a good lesson on how our kids want for too much when all these kids want is food and drink and not to run around in little if any clothes they love old baseball caps and football shirts. You should give everything to your guide to give out as the kids know the guides and he will stop them from fighting and make sure they all get something. We found the pool too noisy for us and spent the time on the beach however the kids love the pool and the team around the pool entertain them very well. If you want a walk you should walk right and you can look around all the other hotels this is a great walk and very safe- However I would advise you dont walk the other way there were reports of locals stealing peoples bags ect and the police advise you to stay clear of this area. The evening entertainment was very poor. 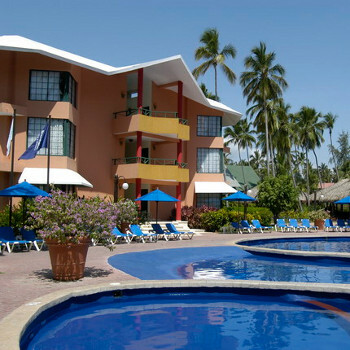 Overall I would say a great place the Hotel is now looking very tired and in need of some love and attention give Barcelo a year and this place will become even better. This is a 3 star hotel through and through. We've been to Bavaro before, and this is probably one of the least luxurious resorts there - but it's also the cheapest resort. So if you go expecting 3 star food, service and rooms then you won't be disappointed. Buffet was OK, usual salads, cold meats, and hot plates - with live cooking of pastas on demand. Was alot of repitition though, always seemed to be roast beef on cut or beef steaks. Breakfast was again the usual all inclusive fodder, with the absence of fresh smoothies being made which was abit of a bummer. Egg station for friend eggs etc, toast aswell as the usual bacon and eggs etc. The all inclusive option isn't 24 hours, and the snack bar serves food at odd times so it's not always possible to eat when you feel like it here, which is against the all inclusive principle in my opinion. Drinks measures are generous, and serv ed in some bars in full size glasses which is a welcome sight. Pool was large, with plenty of sunbeds on offer well into the afternoon (even at full spring break occupancy). If you're going for peace and quiet, this isn't the best place to go as the nightlife can be a little boisterous (particularly during spring break). I think overall this resort lacks that dominican charm. If you're going with thomson, DON'T book any excusions with your rep - they are ALL available within the hotel or watersports centre at at least half the price. I visited this hotel very worried after reading previous reports. This hotel is lovely, very clean the staff were very friendly and the food was good. We had a lovely room and a bottle of champagne on arrival. As I had emailed the hotel previously as this was a holiday for a special occasion. The pool was huge! Very clean, even the cleaners would get in the pool daily to clean it!! All staff were very friendly to us. I will advise that yes you do get a few locals coming to the hotel for the weekend. All I can say is make sure you get your towels out in the morning and just watch any valuables. Nothing to worry about. No need to take towels with you as you are supplied these for use daily. Nightlife is OK, not that great but if you are after a relaxing holiday with a late night drink sat by the beech this is the holiday for you!! Please do not worry about the reports that you read. My family and I thought on first glance that this hotel looked great with a lovely location. Food terrible. No nightlife at all. Nowhere to go and nothing to do at night. Staff were ignorant. We have just returned from at great holiday at this hotel. Checking in was a breeze. Coach loads turned up and we were dealt with within 10 minutes. The room was really nice. We had emailed previously to inform the hotel that it was our 15th wedding anniversary and they gave us a lovely room with pool and sea views with 2 double and 1 single bed in it and a bottle of champers in the fridge. The room was a bit dated and musty but it was clean and the smell went off within a couple of days. The rooms were cleaned by 3pm every day. The food was great. We only ate at the buffet once which was a bit limited for choice. The other days we ate at the speciality restaurants every night. Just queue up at 9am in the morning by guest services and you can book a table for your evening meal. We had no problems getting in. Our favourite was the Japenese and French followed by the Italian and Mexican. The service was excellent in all the restaurants apart from the Marlin (seafood and grill) where we never did get offered any drinks, we had to get our own in the end, but the food was quite good. The pool was great with plenty of activities and the beach was amazing! There were plenty of loungers but not much shade so you had to be up by 7am to bag some. The staff on the whole were very good and the cocktails and all inclusive Baileys were very welcome. The kids had a great time, there were pool tables, wall climbing, trapeze and trampoling. The weather was perfect and we never got sick, all in all we had a superb holiday at a bargain price! We arrived as this hotel and were checked in really quickly our bags arrived to our room within 2 minutes of us putting the key in the door. The room and hotel was clean and tidy and the staff were friendly. For the first night we ate in the buffet restaurant which was nice, every other night we ate in the specialist restaurants, are favourite being the Japanese (highly recommend) followed by the Italian. The staff particularly the pool bar staff were friendly and great with our daughter who thought it was great that she could get a cocktail (alcohol free) whenever she wanted which was most of the time as the weather was superb. The entertainment wasn't brilliant but the entertainments team worked non stop through the day and putting a show on every night, but it kept our 5 year old amused and as far as I'm concerned if the kids are happy then you are happy!! I cannot believe that people were slagging this place off. We had an excellent time and would certainly visit it again there was loads to do throughout the day and thats the main thing. The only quirk I have was at the weekend when it was overrun by locals who thought they owned the place and would try to take over the bar, but with a bit of shoving and pushing you did finally get a drink!! To keep it short and sweet. The beach was out of this world. The pool was ok, too many people had put towels on sunbeds and gone down to the beach leaving no free beds for those of us who wanted to sit by the pool. The food in the main buffet was ok. Speciality restaurants were all(apart from the dominican)really good when you manage to get appropriate times and enough seats for the whole of your family. The staff were ok. There were a handful of staff that couldn't do enough for you but I did find a lot very ignorant. The rooms weren't too clever either. Leaking air conditioning, blocked toilets. ants on bed covers and patio doors that would not lock were to name just some of the things that we encountered during our stay. The entertainment. Well ..... what entertainment. It was the worst entertainment I have ever seen. f you do plan to go on the trip take pencils and books etc for the kids there as they really do appriciate them. All in all I would not go back to this hotel. In fact it has put me off going back to the Dom Rep altogether.